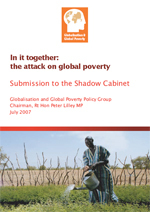 Peter Lilley launched the Globalisation and Global Poverty Group’s final report this morning. It is substantial, detailed report and it makes 76 recommendations. You can download a copy of the report here.